Geek Girls Rule! 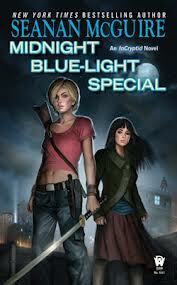 #254 – Review: Midnight Blue-Light Special by Seanan McGuire – Geek Girls Rule!!! Ok, so I bought this book the day after it came out, and then did not have time to read it until last week. Wherein, I devoured it in two days of bus commute, finishing it up over dinner while ignoring my husband and room-mates. So, if all you’re looking for is: Is it a Seanan McGuire novel, and up to her usual standards? Yes. Yes, it is. So, you’re done. Now, if you want some more info on why, then keep reading. If not, then go buy it. Now. Synopsis: The Covenant of St. George is coming to New York to check up on Dominic and to gauge whether or not it needs to be purged of Cryptids. Dominic is torn between his loyalties to the Covenant and his love of Verity. And Verity worries about whether he’ll betray her and the entire Cryptic population of New York. Telling you any more would be potentially spoilery, and I try to avoid that. It wouldn’t stop me from reading, or enjoying it, but I know some people really hate that. So I’ll stop. Yet again, the rich background on the various Cryptid species is almost better than the love story between Verity and Dominic. You learn a little more about Tanuki, Waheela (I freaking love Istas! ), the Aislin Mice, Dragons, all of the Cryptid species have wonderful backgrounds, based on folklore and fleshed out by Seanan’s fantastic imagination. I honestly don’t know what to tell you guys about this book that I haven’t said about the others. She is a master of exposition, feeding you what you need to know without info-dumping you. Her dialogue is natural with good flow, and her pacing is incredible. As always. And while the gut-punch didn’t hit me as hard in this book as it usually does, that may have more to do with what’s going on in MY life now, than anything to do with whether or not it really was as gut-punchy as usual. You really do feel Verity’s angst and uncertainty about whether or not to trust Dominic and his defection. Dominic’s pain is very, very real, and apparent. And the Covenant is a pretty amazingly bad, bad guy. They definitely fall under the “Every villain thinks he’s a hero” heading, having become so amazingly rigid in their thinking about Cryptids and their place in the world that they CANNOT adapt. They are also a fantastic, if fictional, example of why religious fundamentalists freak me out so badly. So, yes. Go get this book. Especially if you read the first one, but having read the first one is not necessary to understanding this one. As I said, Seanan is fantastic at giving you enough background and exposition that you don’t need to do additional research, or need to have read the previous books to appreciate whichever number you do happen to pick up. FWIW, totally agree. Seanan McGuire is definitely one of my favorite fiction/urban fantasy authors at the moment. The Rosemary & Rue series slightly edges out this one for me, but this series is also proving a great read. I also really dig her Mira Grant zombie series.